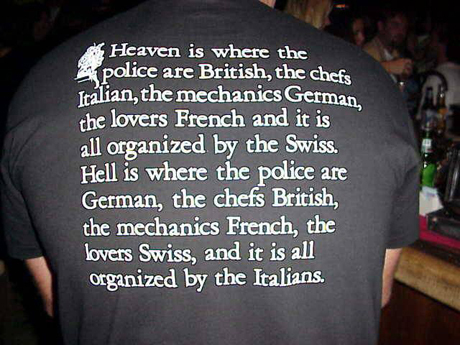 Heaven is where the police are British, the chefs are Italian, the Mechanics German, the lovers French and it is all organized by the Swiss. Hell is where the police are German, the chefs British, the mechanics French, the lovers Swiss and it is all organized by the Italians. Unfortunately for the creator I forgot where I found this.